Alt-J is a band comfortable being in two places at once -- well-known and completely unheard of, popular and critically acclaimed -- a band which stands on a precipice because it enjoys terrifying heights and crushing depths, sometimes in the same song. You suppose you've been standing on that fulcrum for a long time now. It is the one where bizarre pop bands sell out many-thousand seat venues, the one where "indie rock" has ceased to mean anything other than most nebulous vagary of a style, the one where Arcade Fire and LCD Soundsystem separately sold out Madison Square Garden in the same six-month period. That fulcrum, the one you balance on like a jittery gymnast, is the watershed between the avant-garde and the popular, and Alt-J, a curious pop band from the UK with one of 2012's best releases, An Awesome Wave, are there with you, poised somewhere between real stardom and the weird circus of R&B and rock they let run free on their debut record. Not that this duality is unfamiliar. An Awesome Wave, a rewarding and unfamiliar polyglot. The New York Times sent a reviewer to their sold-out, midnight show at the post-industrial, gentrification strip-mine that is the Glasslands Gallery in Brooklyn, a virtual tectonic rubbing of the established and the emerging. 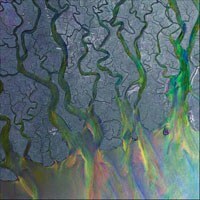 Their very name is an artful collision between the achingly popular and the unflinchingly weird: Alt-J, a combination of computer keyboard commands. The final act is one of form meeting function, art imitating life, where Alt-J balance their musical arrangements as carefully as so many listeners weigh their taste, a series of delicately crafted creations that retreat when chased and refuse to be either "the next big thing" or any music critic's under-appreciated footnote. This tension between the approachable and the unknown begins with the band's first two single releases. The debut single, "Tessellate”, a sultry mediation, is a collision of woozy keyboards that culminates in the title lyric stuffed in a hush at the back of the chorus. Like a bunch of Radiohead songs that got sidetracked at a James Blake show, the opportunity cost in "Tessellate" is high and the payoff is dubious if pretty. But, "Breezeblocks”, the band's second single and the song that directly follows "Tessellate", is their most approachable melody and most coherent arrangement, the kind of thing that launched a thousand college radio stations. The final repeating lyric of, "Please don't go, I love you so" is as infectious a hook as any indie rock will produce in 2012, followed quickly by the sublime cannibalism of, "Please don't go, I'd eat you whole," lest you get the notion that you should get entirely comfortable singing along. The same can be said of "Dissolve Me”, an ebullient progression with a first lyric about "two tabs on your tongue”, the listener cast as the universal solvent for any manner of things: drugs, lyrics like "broken sweethearts who sleep apart”, an arrangement that explodes and ebbs in equal measure. The final supposition, "She makes the sound, the sound the sea makes to calm me down" describes the crashing tidal quality that colors the pretty schizophrenia of the album, the highest of highs and the lowest of lows, a balancing act only for the talented. The similarly upbeat "Something Good” even concludes with the sorrowful, "something good tonight makes me forget about you for now”, moments of relief in the midst of a frenzied sadness. Even more unsettling is the interlude on "MS”, where the band fires depression back toward itself with the circular lyric, "dark seeks dark”, an absolutely crushing form of magnetism. The disjointed gothic pop of "Fitzpleasure”, a menacing and catchy melody, describes the band's shift in time signatures and favoritism for second and third movements, a feature that fosters so much of An Awesome Wave's uncaptured feeling. It risks feeling frustrated and frustrating, but Alt-J's bizarre pop is ultimately rooted solidly in pathos, in a sort of blighted redemption. They favor cacophony for its ability to offset silence, enjoy spiraling out of control for its appreciation of the meticulous. And this is the final analysis of Alt-J, a band comfortable being in two places at once -- well-known and completely unheard of, popular and critically acclaimed -- a band which stands on a precipice because it enjoys terrifying heights and crushing depths, sometimes in the same song.